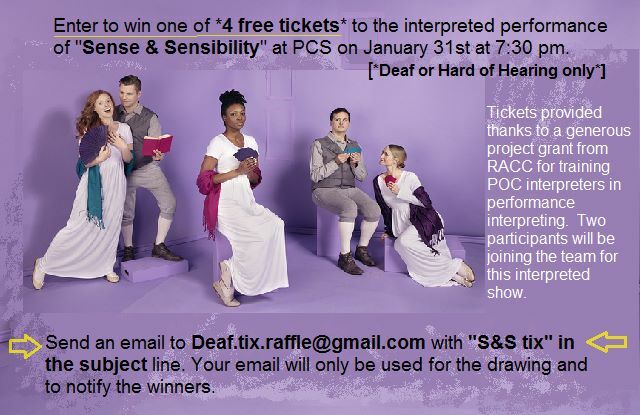 We have 4 free tickets to give away to the interpreted performance of "Sense & Sensibility" on Thu 1/31 at 7:30 pm, thanks to a grant from RACC (Regional Arts and Culture Council). This grant is to provide training for Interpreters of Color in performance interpreting. Two of the participants will be joining the team for this show - meaning there will be a team of four interpreters! Send an email by January 21st with "S&S tix" in the subject to Deaf.tix.raffle AT gmail - and include your name in the body of the email to enter. Winners will be drawn at random; email addresses will only be used for the drawing and to notify winners.